Designed for safe storage and product transfer. Chrome construction for durability and front office looks. Heavy duty construction design handles loads easily and safely. Comes standard with 2 shelves, 1 top, 1 bottom, (4) - 64" posts and 1 set of doors, side and back panels with hardware kit. Come standard with 5 x 1-1/4" Polyurethane stem casters (2-swivel, 2-brake/lock swivel). Heavy duty carts have an aluminum dolly base with 6 x 2" polyurethane casters (2-swivel, 2 rigid).Additional intermediate shelves available. FOB Shipping Point. 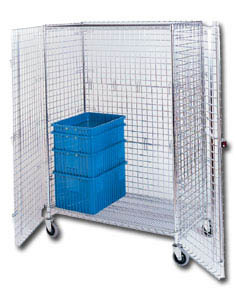 To order additional Shelving, see infomation on 3-Sided Carts. Product No. Size W x L Overall Height Wt. (lbs.) Price Ea.